This tour starts at 9am. Experience the fresh Bali Morning. This tour starts at 3pm. Enjoy the cool afternoon and the amazing lighting. The rice paddies, historic temples, and rural villages around Ubud make an idyllic backdrop for a cycling adventure. On this tour, make easy work of Bali’s steep hills with an electric bike, stopping along the way to admire the Tegalalang Rice Terraces, a UNESCO World Heritage Site. Plus, explore local villages and enjoy a delicious Balinese lunch at a local restaurant. Your morning begins with pickup from your Ubud hotel and a short transfer to the starting point by air-conditioned minivan. After a quick demonstration on how to use your electric bike, hop on and set off to explore the beautiful Bali countryside. Helped by your electric-powered bike, climb effortlessly uphill to enjoy a stunning view over the Tegalalang Rice Terraces. As you admire the verdant landscapes, listen to your guide explain Bali’s unique irrigation system and learn more about local farming practices and traditions. During the bike ride, make plenty of stops to take photos, visit temples, and explore rural villages. Tuck into a delicious Balinese-style lunch at a local restaurant, before returning to your hotel. What better way to see the Ubud landscape, than by bike!? Sights, sounds, smells and views, it really is the best way to see Ubud and you are doing it in an environmentally friendly way. Really beats driving from spot to spot in a car! 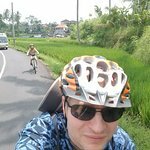 Get quick answers from Half-Day Electric Bike Tour of Ubud staff and past visitors. Can 65 year olds do it? I would not recommend anyone do this if at all unsure or not fit. Yes its great fun but it is hard to manoeuvre in the rice paddies and can be awkward for some. You can always get off and walk thru some areas. Its a beautiful ride, with caution. We have a 14 month old baby; can she come?